Was it really just a few weeks ago that Ariana Grande was declaring herself "the happiest I've ever been"? Back in August, that was her truth. 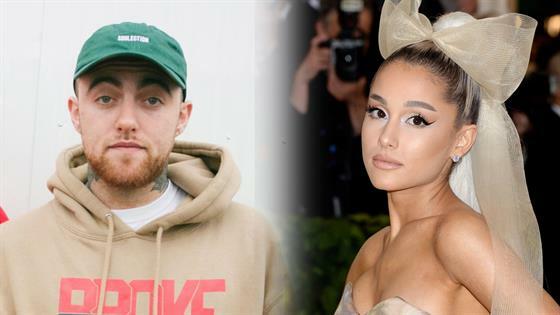 She'd extricated herself from a relationship that had become more painful than productive, due to rapper-producer Mac Miller's substance abuse issues. And she'd happened upon love again quickly and all at once, falling into one of those whirlwind romances where each half explains their inexplicably instant connection with a breezy, "When you know, you know." With newly minted fiancé Pete Davidson she had known in some sense back when she first shared a rehearsal space with him ahead of her 2016 Saturday Night Live hosting gig. "I jokingly said to my tour manager—I was like, 'I'm marrying him 100 percent,'" she recalled on an August episode of The Tonight Show. And she was right, accepting his ring some two years later, just weeks after they connected on a romantic level. "I mean, it's just a feeling," she explained to Good Morning America's Michael Strahan of her assuredness. "He just ticks every box, and just gets better every day, and I'm very grateful for him. Life is beautiful." But then her old relationship, her old life came careening back into focus, knocking her down with the full weight of tragedy. She was flying when she got the news last Friday that her ex-boyfriend had died at the age of 26 from a suspected drug overdose. She had already shared a snap from the plane to her Instagram stories, but quickly took it down lest anyone think she was doing anything but mourning her lost love. She disabled her comments as well because the Internet, as Davidson recently mused to Variety, is filled with evil "a place where anybody can s--t on you" and some felt the best way to grieve the loss of a talented musician was to attack Grande. As if she is responsible for the actions of a grown man. As if she alone could prevent such a senseless tragedy. She can't, of course. But she had tried. Proving that no one really knows what happens behind the shiny Instagram-ready facade of relationships, Shane Powers opened up on his podcast The Shane Show about what he called his friend's "very strange relationship with chemicals and alcohol" and praised Grande for how much work she had put into helping him recover. Rather than cruelly toss him aside when his demons became too much as some of her more vicious detractors have suggested, she was constantly seeking out new avenues, Powers revealed. "Ariana and him were together and they were very much in love, and I have to say, she was incredible when he was first sobering up. She was a f--king G to him. There could not have been anybody more supportive of him being sober than Ariana," he said of the "God is a Woman" singer. "I saw that, I was around it, I took phone calls from her, 'How do I help? What do I do?' This little girl was unbelievably involved and helpful to him being healthy." Eventually, though, she had to accept, as she wrote to one social media critic after their split, that she wasn't a babysitter and she wasn't a mother "and no woman should feel that they need to be. I have cared for him and tried to support his sobriety & prayed for his balance for years (and always will of course) but shaming/blaming women for a man's inability to keep his s--t together is a very major problem." But, oh, if she could have been a miracle worker. If her continued prayers that he, as she put it, "figures it all out" had come true. Because now, not only is she mourning a man she shared two years of her life with, she has to contend with the churning what ifs in her head. "She completely broke down after she found out about Mac," one insider told People. "She can't believe he isn't here anymore. He was such a special person to her. She is very, very sad....This is a nightmare for her." Now imagine dealing with all of this and happening upon a carelessly cruel tweet suggesting she's to blame for his actions, that she is, as some libelously claimed, at fault. Never mind that it's not true. Beyond the obvious—in no way should a woman be held responsible for her partner's demons, nor should she be required to stay single until he's firmly put them behind him—Miller seemed to have made peace with their breakup. Sure, it was hard, as was his arrest days later for a DUI and hit and run after he crashed his Mercedes G Wagon into a power pole. But both served as much needed wakeup calls. "I lived a certain life for 10 years and faced almost no real consequences at all," the rapper, promoting his new disc Swimming, told Beats 1 host Zane Lowe. "I had no version of the story that didn't end up with me being fine." And now, as he laid low and focused on his album, he was ready to shoulder the ramifications of his actions. That, of course, included closing a romantic chapter with Grande, the woman he'd known since collaborating on 2013's "The Way." Asked if the fishbowl-like nature of their union was particularly stressful, he told Lowe, "Life is stressful! So of course there were stressful times. Look, it's not that unique, you know. I was in love with somebody, we were together for two years, we worked through good times, bat times, stress and everything else. And then it came to an end and we both moved on. And it's that simple!" So, no, he wasn't particularly troubled that she'd moved on faster, gone further in her new romance: "It's all positive energy," he insisted. "I am happy for her and [that she's] moving forward with her life, just as I'm sure she is with me." And for a while she was quite happy, at peace with her decision to move on from a romance she had labeled as toxic. A source told E! news at the time Grande had been "holding Mac together for a long time and it wasn't a good relationship with her." She'd been through a lot with him, echoed another insider, and she was "excited to have a fresh new start with someone who is more stable." In Davidson she found someone able to understand her ongoing battles with anxiety. After all, he suffered from the ailment himself, along with depression and borderline personality disorder. He also got the unique predicament of being at the center of some unspeakable tragedy. For him, it was the loss of his father, a New York City firefighter who was killed in the terrorist attacks of Sept. 11, 2001. At the age of 7 he "learned what death was," he noted to Variety. "To learn how anything can just be taken away from you early gave me this sense of 'F--k it. Whatever dude.' I'm able to do stand-up and f--k around because hopefully the worst thing has ever happened to me happened." It's a positive outlook few would be able to wrench from such heartbreak and it made the comedian uniquely qualified to help Grande work through the post-traumatic stress disorder and the anxiety that had ratcheted up since the events of May 22, 2017, the day a terrorist bombed her Manchester concert, claiming the lives of 22 young fans and injuring upwards of 500 more. "They bonded over Ari's Manchester ordeal and what Pete's been through with his father," one source tells E! News of the couple, "that is something they definitely connect on." So now they have a new struggle to contend with, one that's almost sure to test their burgeoning relationship. Thankfully, the pop star is clutch in make or break situations. Has anyone handled tragedy, like, true, soul-crushing tragedy, better than Grande? In the immediate aftermath of the Manchester bombings, some assumed she had decamped to her grandparents' home in Florida to lick her proverbial wounds. Critics even lobbed insults at her for not immediately rushing to the hospital to meet with victims. But it was back in the States, after briefly pressing pause on the remainder of her tour, that Grande found her purpose. First, of course, she mourned. "When she found out fans of hers had died, she was so sad," manager Scooter Braun recalled in a January interview with the Big Questions With Cal Fussman podcast. "I mean, she cried for days. There was nothing that could stop us. She felt every pain. Every face that they announced, every name—she wore it on her sleeve, like every bit of emotion, because that's who she is." When he initially floated the idea of getting back out there, "She looked at me like I was insane," he shared with Time. "She said, 'I can never sing these songs again. I can't put on these outfits. Don't put me in this position.'" But given a few days to ruminate, she realized how right he was. After Braun flew out he landed to "14 texts from Ariana saying please call me, I want to talk to you about this, please call me, please call me," he said on Van Lathan's The Red Pill Podcast. "And she said, you know, 'I've been thinking about this. I thought about what you said, and if I don't do this, these people died in vain, and I am not who I say I am, so I want to go back out on the road tomorrow.'" Their brainchild, the One Love Manchester tribute concert, mobilized the likes of Justin Bieber, Coldplay, Miley Cyrus, Katy Perry, Pharrell Williams, Stevie Wonder and Miller to the same arena 13 days after the attack and raised more than $23 million for the We Love Manchester Emergency Fund, with $324,000 going to each of the victims' families. Before finishing out the remaining dates of her Dangerous Woman tour in New Zealand, Australia, Singapore, Taiwan and Hong Kong, she visited with survivors at the Royal Manchester Children's Hospital and spent two hours meeting with the victims' families. Noted Braun, "That was the hardest two hours of either of our lives." The effects reverberated for months. "I've always had anxiety, I've had anxiety for years," she shared with Paper. "But when I got home from tour it reached a very different, intense peak. It became physical and I was not going out at all and I felt like I was outside of my body." Unnerving bouts of vertigo would strike without warning, she shared in Elle's August issue. "I had really wild dizzy spells, this feeling like I couldn't breathe. I would be in a good mood, fine and happy, and they would hit me out of nowhere. I've always had anxiety, but it had never been physical before," she recalled. "There were a couple of months straight where I felt so upside down." Avoiding the spotlight—she essentially checked out of public life and social media for several months—and pouring her emotions into her fourth album, Sweetener helped as did the knowledge that she fought back, worked so hard to create something good out of something so vile. "We put a lot on her shoulder, and she took over," Braun told Time. "You know, for the rest of her life, she can say that she is exactly who she claims to be." So now she has a new test, a new unimaginable heartbreak to contend with, another dark period sure to compound her anxiety and push her to the limits of what one person should be forced to endure. It's a lot for one person, particularly one who's only had 25 years on this planet. But does anyone truly believe she can't handle it?